Available across the globe ... the fourth and final volume of the Pinan Flow System is now available as both a paperback and ebook! Use the UK links below or visit your 'local' amazon provider or order it at your local book store! 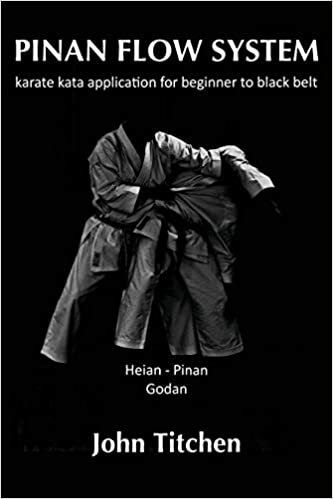 This book, the final instalment of a four volume series, examines the fifth Pinan / Heian kata. With practical application drills based on both the study of the reactions of students to common forms of aggression and violence in high pressure scenario simulations and years of research into violent crime, it contains a look at some of the myths surrounding the purpose and application of kata, along with a review of the rationale for using interlocking drills to progress from static to dynamic training, and an illustrated discussion of the difference between form and function in training for flexibility, fitness, and fighting. "So here we are with the final volume of this series of books from John Titchen! You can now see John’s full interpretation of the Pinan series! How cool is that! “Having mastered these five forms, one can be confident that he is able to defend himself competently in most situations”. The Pinan / Heian series were therefore always intended to be a holistic self-protection system; and I think John’s books have shown a great way in which this traditional view can be realised! John’s take on the Pinan / Heian kata is a very logical and well-structured bunkai theory. It is not a collection of “tricks” which happen to look like the motions of the kata, but a valid bunkai theory based on, and permeated by, sound underlying combative principles. It’s not the same as my theory, but I acknowledge its utility and the fact it meets all of my personal criteria for validity. It is very good stuff! Now that the series is complete, you can take the information presented within and run with it “as is”, or use the information John has given you to help inform your own take on the kata series. We can then move past the “analysis stage” to use the kata in the way Funakoshi said they were originally intended: as a holistic self-protection system. This is what John has presented. These books have made a great contribution to the collective knowledge base of the practical karate community. Well done to John for writing them! Well done you for reading them!"